We have. over the years, giving life to a welcoming place to live, taking care of old olive trees, planting old varieties of fruit, growing vegetables and breeding bees, all with natural methods, respecting the environment. These codes, entered in the "location" search field, allow you to view each ad. We have at your disposal a large swimming pool of 15x5m, located in a sunny and private position, with a beautiful view of the surrounding hills. There is a shaded patio, solar-heated shower and wooden fence for the little ones. During your stay you can taste our extra virgin olive oil of superior quality, produced with the internal oil mill, but also collect the ripe fruit and vegetables from the garden, as well as taste our millefiori honey. - a large living room which leads to the external garden through a sliding window. Here is a table where you can dine in the cool summer evenings and a large lawn to play. Free unlimited free WiFi in all rooms and near the property. There is also a laundry room with washing machine, ecological detergent, clothesline, iron, ironing board available for guests. The apartment is supplied complete with bed linen, towels, kitchen towels and pool towels. At Capoverso we cultivate land and fruit plants with natural methods. It is our specific desire to give guests the chance to taste fresh and genuine flavors, so it is possible to access them free of charge and with respect to our vegetable garden during our stay at the property. Meals can be prepared on request. Our visit to Agriturismo Capo Verso went beyond meeting our expectations. Chiara and Gianluca made themselves available at all times to provide information about local attractions and offer suggestions for day travel. They also made their plentiful garden available to us where we picked tomatoes, strawberries and peppers, just to name a few. The apartment is comfortable and nicely decorated with wonderful vistas of the local hillsides. The en-suite bedrooms created perfect privacy for two couples. The farm is conveniently located close to the A1 autosrada and within easy driving distance to many hill towns. Gianlucca arranged for a tour of their local winery where we returned many times to purchase the delicious wines. Monte San Savino itself is relatively undiscovered with few tourists in the early fall. We went to many of the local restaurants and were delighted not only with the delicious local foods, but the willingness of the proprietors and service staff to help us with the language in making menu choices. Adding an extra sparkle to our holiday was Chiara and Gianluca's family, their beautiful daughter, Julia, Chiara's father, and their furry family, most notably their gentle dog, Camilla, and Tigro, the friendly cat. 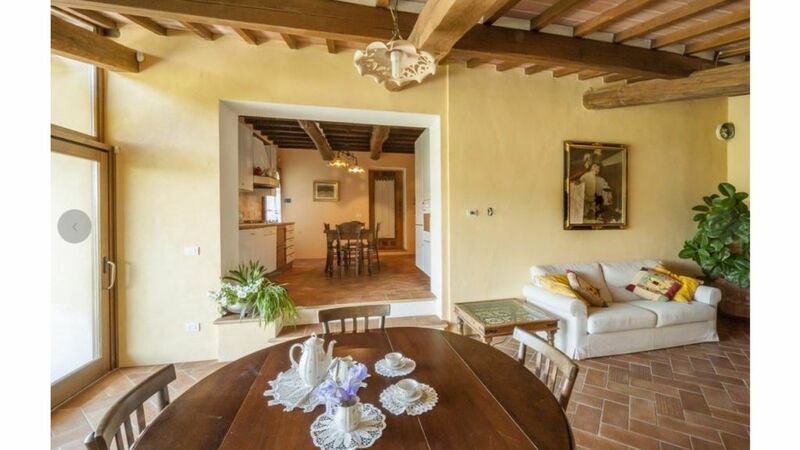 I would highly recommended renting this property as the foundation for a Tuscan adventure. A wonderful spot for enjoying the long days under the sun. Chiara was a wonderful host where everything was just perfect. Would highly reccommend. This apartment is in a very beautiful location with nothing but spectacular views of the Tuscan countryside. It was perfectly spotless and had everything we needed. We walked to town for dinner each night, it's about a 20 minute walk. Monte San Savino is a perfect sized hill town. It has a bakery, a gelateria and quite a few restaurants and pizzeria's, etc. A great spot to visit many nearby hill towns. The owners live in another house on the property and are very happy to help you with whatever you need. We had a little trouble finding the house and weren't using an Italian phone so we went to a restaurant for lunch and I emailed Chiara and she sent John Lucca to pick us up!! So kind. We were there at the end of May and the days were hot, so having the pool was great. It is set amongst the olive trees and the organic gardens. Thank you very much Chiara, John Lucca and Julia! Das Beste an dieser Wohnung ist die Lage. Von der Terrasse hat man einen traumhaften Blick auf die Typische Toskana Landschaft, Sonnenuntergang inklusive. Chiara und Gianlucca, die Vermieter sind phantastische Gastgeber, jederzeit mit Ausflugstipps und sonst allerlei nützlichen und wissenswerten Tipps bereit zu helfen, ohne dabei aufdringlich zu sein. Vielen Dank Euch beiden für die schöne Zeit. Wir haben uns sehr Wohlgefühls und Gian-Luca und Chiara standen uns jeder Zeit mit Auskünften zur Verfügung. Als Ausgangspunkt für viele schöne Rennradtouren gut geeignet. Das Olivenöl von Gian-Luca war köstlich. In Arezzo we point out the presence of the oldest Fiera Antiquaria d'Italia, which takes place every first weekend of the month and invites national and international visitors.